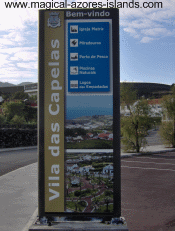 The village of Capelas was once the site of a whaling factory in Sao Miguel Azores. 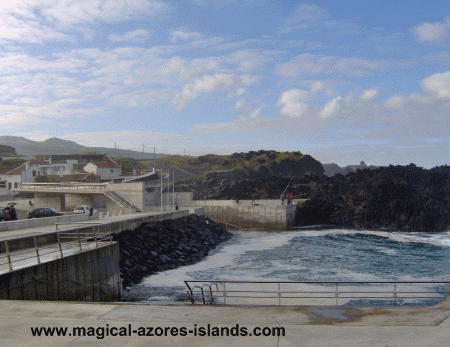 The area has changed in the past thirty years, now that whaling is no longer practiced in the Azores. The area now has a great natural swimming area that you can see in the next picture. 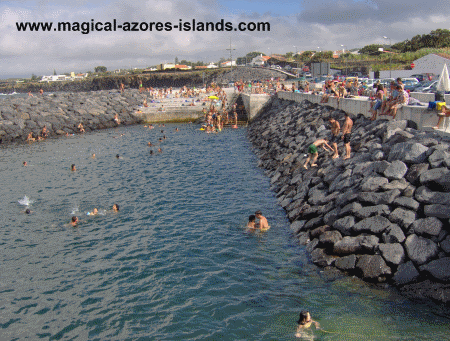 On the right side of the picture is an area where there is a break wall from the ocean. You can see the swimming area between the dark rocks of the break wall and the concrete. On the day that I took this picture it was far too cool and the waves were too big for swimming there (even with the breakwall). But in the summer it is a different story. The parking lot is almost full in the summer and the swimming area has dozens of people cooling off in the water. One more note about the picture above. Behind the concrete building (a change house), is a road going up the hill. At the top of that hill is the Capelas Lookout. This is a nice spot to stop and watch the waves pound the coast, especially on a windy winter day when the waves are huge. Here's a closer look at the swimming area. As you can see it doubles as a fishing hole in the winter.